Tumbled out of our *warm* bed this morning with great reluctance…it was 42 degrees last night. The sun was warm though and the blue sky had us anxious to get on the road. We headed toward Burlington, where we had left some pictures to be developed. Course we didn’t get far before I was jumping out of the car…camera in hand. There is beauty all over this countryside. There was a wonderful waterfall, spilling down the hill side. The foliage is beautiful. 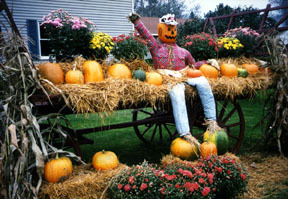 We stopped at little antique shops and country stores and farm markets…they have wonderful displays of scarecrows and Pumpkins and flowers and sheaves of corn. The houses are beginning to decorate as well. There was one of a witch on a broomstick. She had on striped colored socks and was life sized…just wonderfully done. Most of the houses and little farms are beautiful but, of course, every place has that “one” that the neighbors just *love*. We went by a place today that fits that bill. The front yard was dirt and there were chickens, pigs and goats, running all over it. The kids were playing on the porch and the horse had his head in the window…chewing away! Shades of Ma and Pa Kettle! 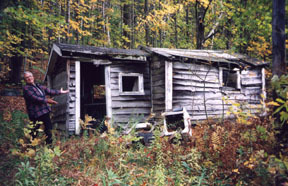 We even found one house in Vermont that we could AFFORD! When we were done in Burlington we headed toward Stowe again. 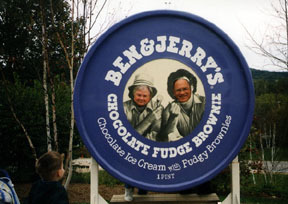 It had clouded over and so we took the opportunity to tour the BEN AND JERRY Ice Cream Factory. Very interesting. And the ‘samples’ were yummy. Saw two deer at the edge of the forest…what a pretty sight! Back on the road..for a bit! The older I get…the more important creativity becomes! phototraveler on Something that touched me today. phototraveler on The home where I grew up. phototraveler on Our little Golden Finches have found the peach tree!